electro-music.com :: View topic - AUTUMNAL EQUINOX 2009 STREAMING CONCERT Sept.19 Sat. AUTUMNAL EQUINOX 2009 STREAMING CONCERT Sept.19 Sat. 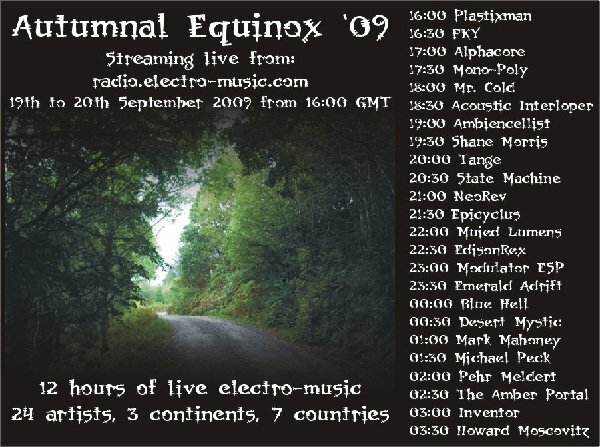 Posted: Thu Aug 06, 2009 4:05 pm Post subject: AUTUMNAL EQUINOX 2009 STREAMING CONCERT Sept.19 Sat. It's that time again... Celebrate Fall with a 12 hour streaming concert at electro-music!!! Join in the ChatRoomand Tune into the Radio Stream and celebrate the changing of the season with us here at electro with 24 performers from 7 countries, covering 3 continents. Live coder of text_2_midi and Ruby code mixing found sounds and electronic abstractions in a blend of Ambiances to total Fractured beat chaos..
6.One or Two Paragraph Description: Deep Space mining operations and radioactive research development. I will be playing ChucK music. ChucK is a music programming language from Stanford and Princeton Universities. ChucKists, as we are called, share our code freely with each other and the world. It's ecclectic, original, and unique. Progressive Ambient. We will both do a half hour for a total of one hour. Who knows what i'll be doing. I like beats. I like noisiness.. probably what you will hear will be a combination of the two. Also.. Edcast has a linux client that is CLI only. It works with JACK, and works very well. I can help get someone running with it if they need it. Thanks for the Linux info Cody... and Welcome aboard! Congrats! Alphacore and Mrcold the first new-comer to the concert series this time!!! 6.One or Two Paragraph Description: Chaotic circuitry collides with melodicism. Solo passages give way to dense networks of activity. Diverse timbres are explored, and a fine time is had by all. Ephemera is transitory written and printed matter not intended to be retained or preserved. The word derives from the Greek, meaning things lasting no more than a day. In library and information science, the term ephemera also describes the class of published single-sheet or single page documents which are meant to be thrown away after one use. This classification excludes simple letters and photographs with no printing on them, which are considered manuscripts or typescripts. Large academic and national libraries and museums may collect, organize, and preserve ephemera as history. 1.Preferred Start Time (Please use GMT/UTC): EDIT: Somewhere in the neighborhood of 18:00 GMT. 6.One or Two Paragraph Description: God only knows. I have another round of enhancement to do on the game-based software instrument that I played for Summer Solstice. If I reach a breakthrough in instrument design and playing technique, and have something substantially advanced beyond what I had for SS09, I'll play that. Otherwise, it'll be processed acoustic instruments, maybe something that I'm working on for EM2009. 6.One or Two Paragraph Description: Everybody Get On The Disco Bus! Welcome 3rd and 4th newcomers NeoRev and AzAxeman!!! Wonderful to have you guys sign up! I'll try to tune in, but for now I'll pass on a performance. But..... my last performance @ summer solstice has finally become available. Crap - I just realised I won't be able to perform or probably even listen on the 19th. Oh well, there's always next time. I'm withdrawing my application. Great, found out my trip to "AC" New Jersey was the weekend after this event SO, I can play !! Yippi !!! 6.One or Two Paragraph Description: Representing part of the MIDIBEAR crew. The electronic music collective of Long Island NY. Just as the seasons are cyclic, so to can electronic music. In celebration of the cyclic seasons, I present to you a live performance entitled "Cyclic Redundancy" as played using my DIY "Appendage Touch Ribbon Controller" adapted for MIDI, some analog modular gear, Klee Analog Sequencer, and computer sequencers. The Klee is clock synchronized to the computer sequencer via the Appendage MIDI adapter as well. Posted: Sat Aug 08, 2009 2:27 pm Post subject: is there a flyer for this ? Subject description: flyer for this event? Hello I was just wondering if there was a flyer made that we could add to are sites to help promote this event? if not i could design one up just wonder when the event time is noon to midnight ? GMT of course..
As for the timing the current idea is to go from 1600 to 0400 GMT ... but this is subject to change, depending on how many people sign up anf at what time they would prefer to play .. so this needs some time. I have left the flyer in Jez's hands for now, but I did offer my help if he needs it. I'll send a PM to him to find out what is cooking.